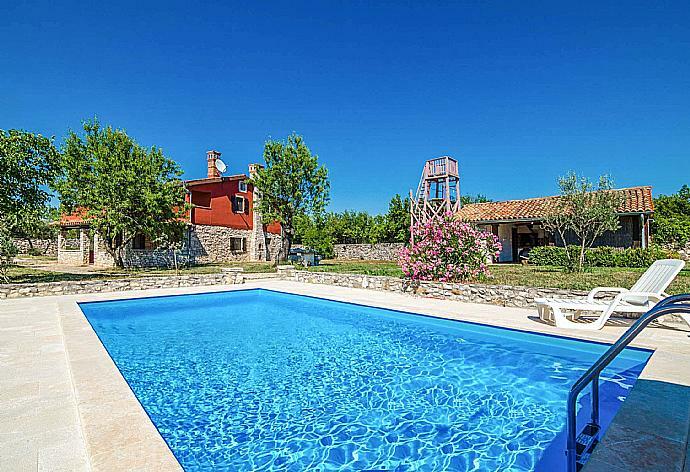 Villa Paradiso is located in Labin, Istria. This detached vacation rental property is air-conditioned and sleeps up to 6 people with 3 bedrooms, 3 bathrooms along with private swimming pool. Villa Paradiso is nesttled in the small hamlet of Kunj, overlooking the Rasa valley, and close to the beautiful hill-top town of Labin. The pretty coastal village of Rabac has delightful coves and beaches close by. The property is secluded and ideal for people looking for an idyllic lush green landscape in a very quiet location. The entrance to the grounds is via a gate with private parking. There is a large covered terrace with seating area. Inside, there is a fully equipped kitchen with dining, a living area and a bathroom on the ground floor. On the first floor there is one double bedroom, two twin bedrooms, a bathroom and a sun terrace overlooking the landscape. Outdoors is a large pool area and beautiful grounds with fruit and olive trees. There is an outside BBQ with a covered terrace, sauna next to the pool area, and a half bathroom. The Air Conditioned living room has sofas, WiFi Internet, Satellite TV, dining area and ornamental fire place. Villa Paradiso can sleep up to 6 people. Lovely Property, People and Food! We returned last week from a very relaxing (and much needed) break away from the busy life at home. We wanted a traditional stone property, that was nice inside, and Villa Paradiso did not disappoint. Visnjan was a very pretty village and the local taverns served wonderful food and wine! Local spring flowers carpeted the walk from the villa to the village - it was heaven. 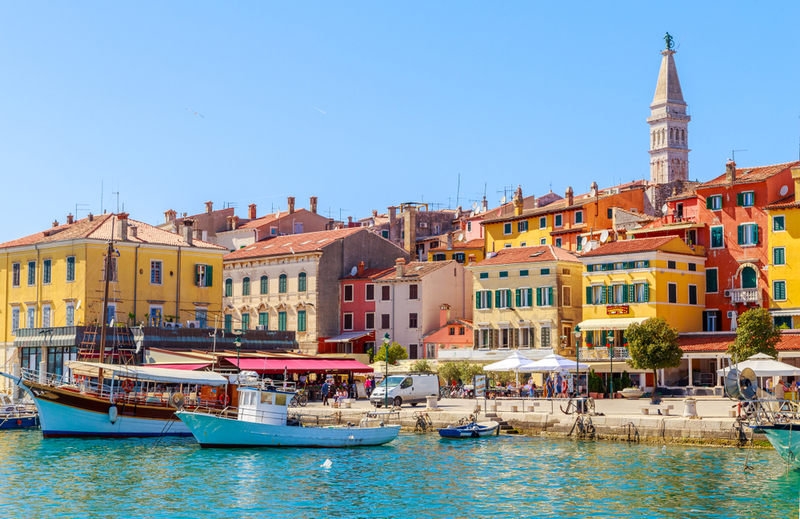 The rest of Istria was pretty too, especially the water-side town of Rovinj, which we drove to twice. I would be very happy to recommend the property and would consider staying again another time. Forgot to mention the sauna - we used it every day! It was a nice touch and we hadnt realised it had one when we booked. Thank you so much. Just back from a very relaxing vacation. The spring flowers were beautiful and we loved walking in the sun! Villa paradiso is just that! Thank you. 5 stars! Loved it. Pool a little cold (was early season) but villa and area was wonderful. Idyllic stay. The property was wonderful. We also enjoyed the local village which was a short walk. The people were friendly and the food divine! We are already considering rebooking for later this year. Charles and Elspeth. 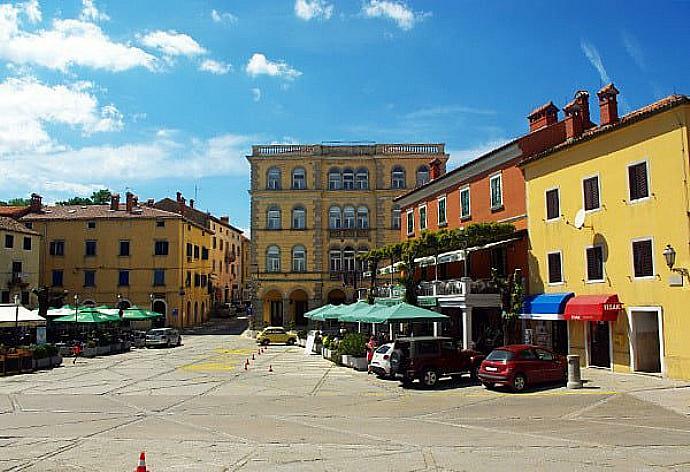 Labin is one of Istria's most historic and interesting Medieval hilltop towns where you will find a mix of different architectures between the traditional pastel colour houses. You will also find a selection of restaurants, Museums and churches to explore. This Property Permits small pets, however, there is an additional final cleaning fee of 100 Euros, payable direct to the owner.